March Madness is upon us. This year, Northwest hoops fans will have plenty to follow, including top-seeded Gonzaga in the West Region and No. 9 UW in the Midwest. Duke, with the most dominant player in the country in Zion Williamson, will be most people’s pick to reach the Final Four if not win the NCAA championship. But a warning to those who want to pick the obvious and take the Blue Devils: Since 2010, Duke has advanced to just one Final Four despite great expectations each year. That will give hope to several other teams in the region, but it will take a quite an upset to knock off the Blue Devils, and the No. 2 seed in the region, Michigan State, might be without key reserve Kyle Ahrens, who had to be taken off the court on a stretcher after injuring his leg in the Big Ten championship win over Michigan. 1,129: Number of wins by Duke coach Mike Krzyzewski, the most by any college coach. 1-11: Michigan State coach’s Tom Izzo’s record against Krzyzewski. 10: Number of years since third-seeded LSU has won a game in the NCAA tournament. Duke: Duh. The Blue Devils have arguably the most talented team in the tournament with a legendary coach. If the Blue Devils play to their capability, they will be in the Final Four, but you can bet if they win this region that they will get tested at least once. Michigan State: Coach Tom Izzo has a reputation of being a great coach in the NCAA tournament, which is understandable since he has taken seven Spartans teams to the Final Four. But it’s hard to overlook that he has not reached the Sweet 16 since 2015. Virginia Tech: The Hokies were 17-3 (including a win over Washington) before star point guard Justin Robinson got hurt and were 7-5 without him. Robinson is expected to play in the NCAA tournament, which gives Virginia Tech a chance to win the region. LSU: The Tigers have won two NCAA tournament games since 2006. They have won several close games, but if luck is not on their side, they could lose in the first round to Yale. Mississippi State: The Bulldogs lost three of their last five games, and their first-round opponent, Liberty, is more than capable of winning a game or two. Louisville: The Cardinals were 4-8 to end the season, but they played a tough schedule in the ACC and are capable of a long run. 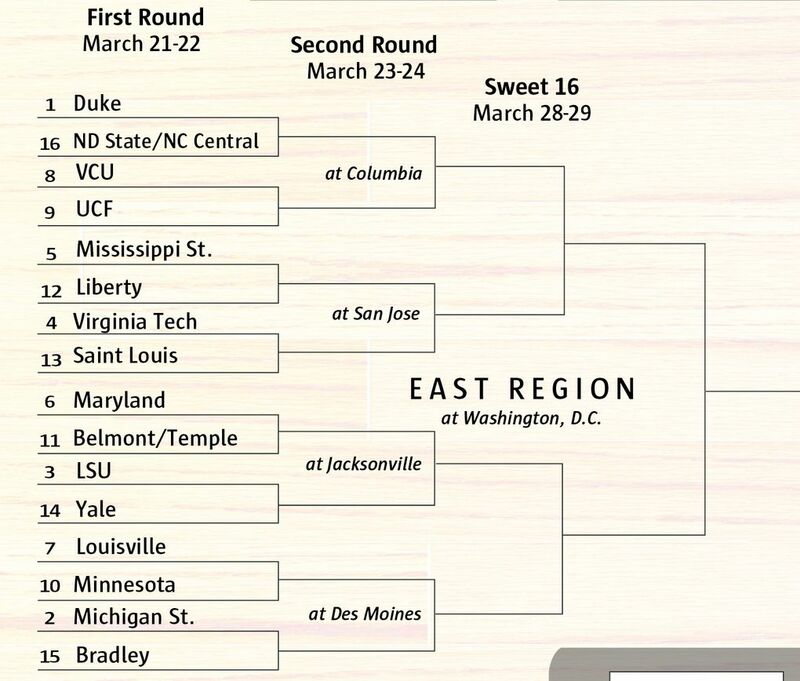 Belmont: Nice work by the committee to include the Bruins in the tournament even though they lost to Murray State in the Ohio Valley Conference tournament title game. They can easily win a game or two. Zion Williamson, Duke: He showed he is totally recovered from the injury he suffered against North Carolina when his shoe fell apart. He plays like a man among boys, averaging 22.1 points and 8.9 rebounds. Cassius Winston, Michigan State: The 6-foot junior point guard averages 19.0 points and 7.5 assists. Dylan Windler, Belmont: The 6-foot-8 senior guard averages 21.4 points and 10.7 rebounds (for a guard!). Chris Mack, Lousiville: Mike Krzyzewski of Duke and Tom Izzo of Michigan State are the big names, but Mack had great success at Xavier before replacing Rick Pitino at Lousiville. Miye Oni, Yale: The 6-foot-6 junior guard leads his team in scoring (17.6) and assists (3.6) and is second in rebounding (6.4). R.J. Barrett, Duke: Because of teammate Zion Williamson, this freshman 6-7 forward is a bit overlooked, but is averaging 22.9 points, 7.5 rebounds and 4.1 assists. Quindarry Weatherspoon, Mississippi State: The 6-4 senior guard averages 18.2 points, 4.7 rebounds and 2.8 assists. Duke: There is no doubt the Blue Devils are the most likely winner, but don’t bet your house on it. They are no sure thing. The last two NCAA runners up are the top two seeds in the West Region. Gonzaga, which dropped the title game to North Carolina in 2017, is No. 1, while Michigan, which fell to Villanova in last year’s championship match, is No. 2. 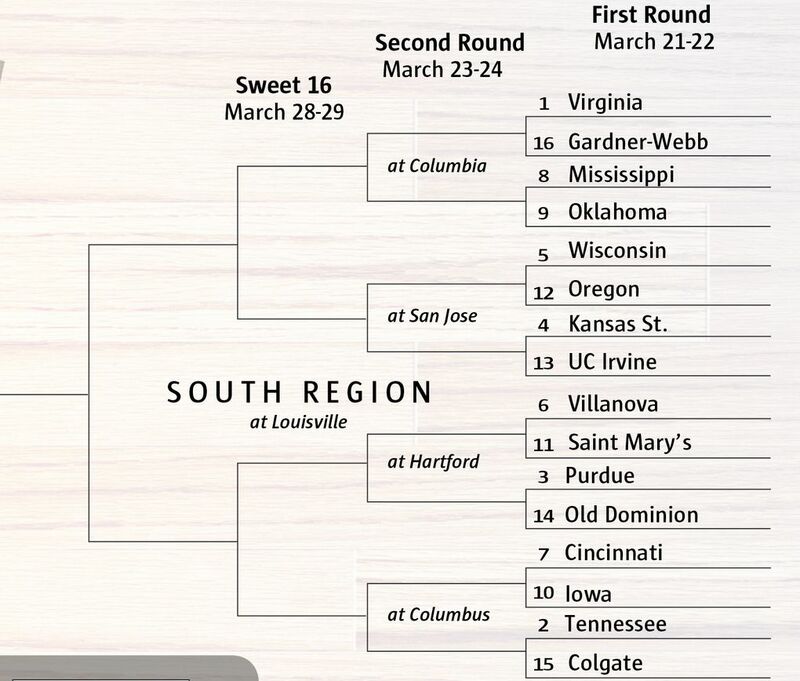 Also in the West field is fourth-seeded Florida State, which knocked out Gonzaga last year with a win in the Sweet 16. Gonzaga and No. 6 Buffalo are two of just five schools in the country with 30 or more victories. The West Region has talent galore, with three players among the 10 semifinalists for the Naismith Award as College Player of the Year represented – Gonzaga’s Rui Hachimura, Marquette’s Markus Howard and Murray State’s Ja Morant. 88.8: Points per game scored by Gonzaga to lead the country. 58.6 and 58.8: Points per game allowed by Texas Tech and Michigan, ranking No. 2 and 3 nationally in team defense. 74: The age of Syracuse coach Jim Boeheim, making him the oldest men’s coach in Division 1 history. Gonzaga: Ranked No. 1 in the Associated Press poll, the Zags were spanked by St. Mary’s by 13 points in the WCC title game. Their only other losses so far this season were to powerhouses Tennessee and North Carolina. With their usual deep, talented and experienced roster, and a win over Duke (with Zion Williamson) on their resume, the Zags are still the team to beat. Michigan: The Wolverines dropped two of their final five games, both to Michigan State, including a five-point loss in the Big 10 tournament final. Michigan is a puzzling team, having stormed to a school-record 17-0 start before going 11-6 down the stretch. The Wolverines play superior defense, but the offense has been inconsistent at times. Texas Tech: The third-seeded Red Raiders were stunned by West Virginia in their Big 12 tournament opener, but they were still the highest-ranked Big 12 team for the first time in program history as well as Big 12 co-champion with Kansas State. They are coming off the school’s first-ever run to the Elite Eight a year ago, where they fell to eventual champion Villanova, 71-59. Buffalo: The Bulls are in the tournament for the fourth time in five years, having gone from a 12 seed in 2015 to a 14 in 2016, a 13 in 2018, and now a six in 2019. That’s highest ever for a MAC school. Last year, Buffalo beat Arizona in the first round of the NCAA tournament, and the Bulls own a win over Syracuse in the Carrier Dome this year. Buffalo coach Nate Oats, with a 93-42 record since replacing Bobby Hurley, is one of the hottest names in the country. Murray State: The Racers are fresh off winning the Ohio Valley Conference Tournament with a title win over Belmont, but what really makes them dangerous is sophomore guard Ja Morant, who averages 24.6 points per game and a nation-leading 10 assists per game. Morant is projected to be a top-five NBA draft pick. Syracuse: Jim Boeheim is the only coach in the field with an NCAA title (as well as two losses in the championship game), but this has been a trying season for the second-winningest men’s coach in history. The Orange enter the tournament with five losses in their last seven games. Gonzaga’s Rui Hachimura was a first-team All-American, while Markus Howard of Marquette and Ja Morant of Murray State made the second team. All three were Naismith Player of the Year semi-finalists. Gonzaga’s Brandon Clark was a third-team All-American. Mark Few, Gonzaga: What Few has accomplished in Spokane to establish Gonzaga is an elite program is nothing short of amazing. Few’s .824 winning percentage is the best of any active coach. He has made the NCAA tournament in each of his 20 seasons at Gonzaga and led the Zags to their first-ever Final Four appearance two years ago. CJ Massinburg, Buffalo: The MAC Player of the Year is averaging 18.5 points per game and is the No. 2 scorer in program history. Anthony Lamb, Vermont: The 6-foot-6 junior has averaged 21.4 points and 7.8 rebounds per game, including 28 and 9 in the conference title game. He racked St. Bonaventure for 42 in a non-conference game. Jarrett Culver, Texas Tech: The sophomore guard is being touted as a potential NBA lottery pick. He’s averaging 18.5 points per game and was named the Big 12 Player of the Year. Gonzaga: It won’t be easy for the Zags, but they are hungry to get back to the Final Four, and the WCC tournament loss could be the jolt they needed. North Carolina and Kentucky are the favorites. 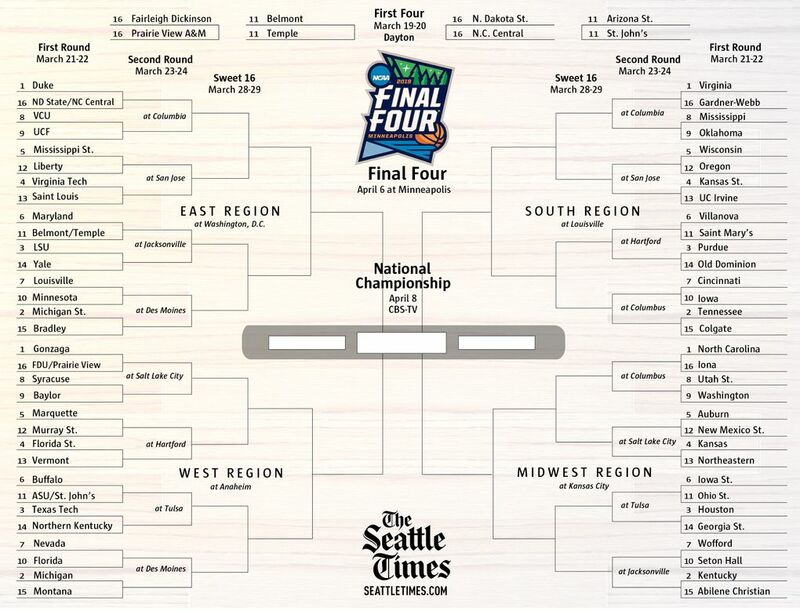 The Tar Heels and Wildcats, two of the most recognizable and successful programs in college basketball history, have unsurprisingly won the top two seeds in the Midwest region of the NCAA tournament. But don’t forget about the 3-seed, Houston, which won 31 games and won an outright conference title for the first time in 35 years. The fifth-seeded Auburn Tigers may also be ready to roar, after Bruce Pearl’s bunch upset Tennessee to win the SEC Tournament on Sunday. 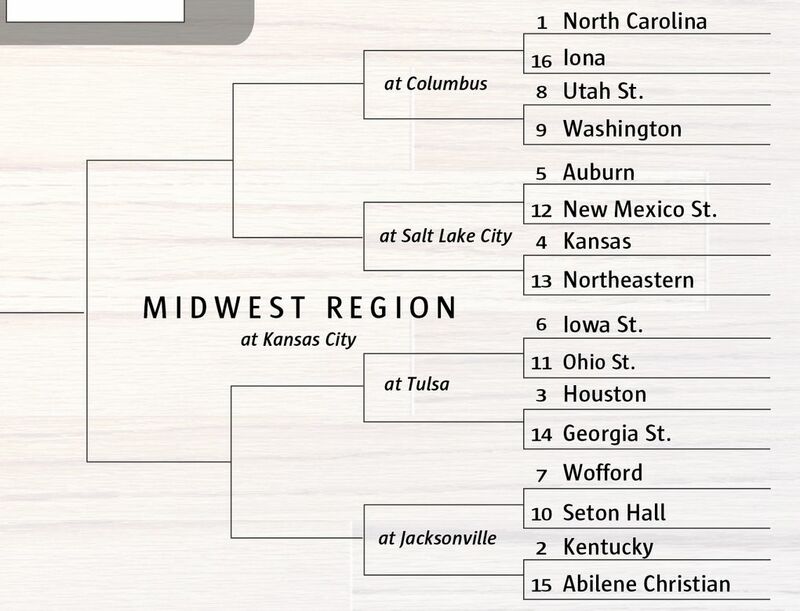 Here’s a closer look at the Midwest region. 2011: The last time Washington earned a berth in the NCAA tournament. 14: The number of combined NCAA titles between No. 1 seed North Carolina and No. 2 seed Kentucky. 5: The number of Northeastern players who shoot at least 39.3 percent from behind the 3-point line. The Huskies (of Northeastern, not Washington) shot 38.6 percent from beyond the arc, which ranked 17th nationally. North Carolina: The 27-6 Tar Heels were the regular season champions of the ACC, undoubtedly the most top-heavy conference in college basketball. This is the first time in the history of the NCAA Tournament that three teams from the same conference earned No. 1 seeds. Roy Williams’ team won eight consecutive games at the end of the season before falling to Duke in the ACC Tournament. Kentucky: Recently, Kentucky has beaten just about everybody but Tennessee. The 27-6 Wildcats have won seven of their last nine games, with both losses coming to the Volunteers. Kentucky has four players that average at least 11.1 points per game, led by sophomore forward P.J. Washington. The Wildcats fell short of a No. 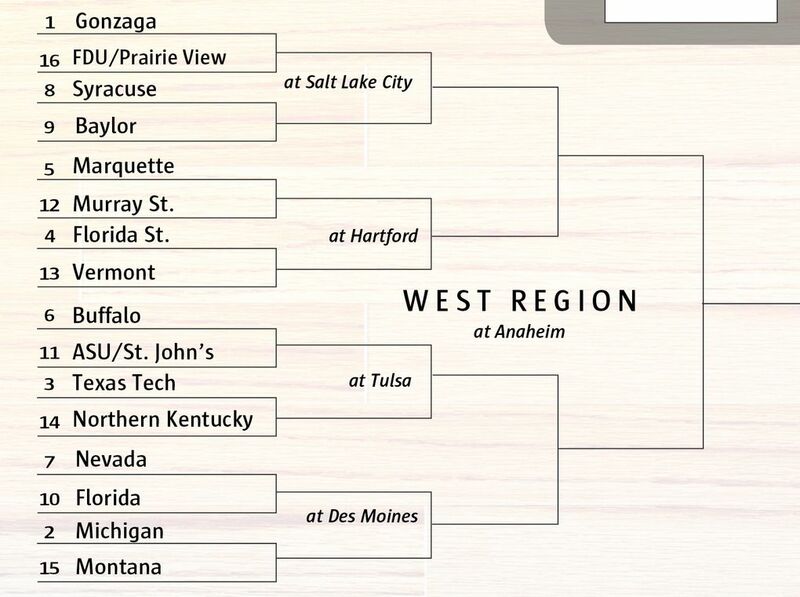 1 seed but should be able to contend in the Midwest region. Auburn: Look out for Bruce Pearl’s Auburn Tigers. Auburn enters the NCAA Tournament on an eight-game winning streak, most recently dismantling Tennessee 84-64 in the SEC Tournament championship game on Sunday. The Tigers have averaged 76.4 points per game during that winning streak. If Auburn gets past New Mexico State in its opening game, Pearl and Co. may have a fortuitous route to the Final Four. Kansas: Kansas failed to win the Big 12 regular season title for the first time since 2001 this spring. The Jayhawks fell to Iowa State in the Big 12 Tournament championship game as well. The team’s second-leading scorer, Lagerald Vick, left the team in February and will not participate in the NCAA tournament. Translation: this may not be the year for the Jayhawks. Washington: Good for Mike Hopkins and Co. for earning an NCAA tournament berth for the first time in 2011. But the fact remains that the Pac-12 was historically bad this season and the Huskies have dropped three of their last seven games. Their supposedly ferocious zone defense also allowed more than 60 points in six of those seven games. Washington would be lucky to get past Utah State in its opening game. Wofford: The mighty Wofford Terriers earned a No. 7 seed, and for good reason. The Terriers finished 29-4 in the Southern Conference and won 20 consecutive games to close the season. They scored fewer than 72 points just once in that 20-game winning streak. In March, if you can score, you’ve got a chance. Northeastern: The Huskies can shoot, which makes them dangerous. Five Northeastern players shoot at least 39.3 percent from behind the 3-point line. The Huskies also get to take aim at a shaky four-seed in the Kansas Jayhawks in their opening game. Cameron Johnson, UNC: The Tar Heels don’t have a freshman sensation, a la Duke’s Zion Williamson or R.J. Barrett. But 6-foot-9 senior Cameron Johnson leads North Carolina with 16.9 points per game and shoots a blistering 46.5 percent from beyond the arc. The Tar Heels have a lethal front court tandem with Johnson and Luke Maye. P.J. Washington, Kentucky: Washington may not be spectacular, but he’s reliable. The 6-8 sophomore forward led the Wildcats with 14.8 points per game and notched double figures in scoring in 17 of his last 18 games. Washington’s 3-point percentage improved from 23.8 percent to 41.9 percent from his freshman to sophomore seasons. John Calipari, Kentucky: Some love him. A lot more hate him. But there’s no denying John Calipari’s coaching credentials. Calipari’s Wildcats have reached at least the Elite Eight in six of his nine seasons in Lexington, Ky. Calipari is still searching for his second NCAA Title, however. Sam Merrill, Utah State: A 6-5 junior, Merrill was named the Mountain West Conference Player of the Year this season, and it’s easy to understand why. He averaged 21.2 point per game, connected on 90.7 percent of his free throw attempts and hit 37.8 percent of his 3-pointers. If Merrill is on, the Aggies can make a run. Fletcher Magee, Wofford: Get this: Magee attempted 353 3-pointers this season, the second-most in the country. The good news: a lot of them went in. The senior guard averaged 20.5 points per game and hit 42.8 percent of his 3-pointers. Don’t expect Magee to let up under the bright lights. North Carolina. North Carolina is both deep and talented, with Cameron Johnson, Luke Maye and Coby White leading the way. The Tar Heels will outlast the competition en route to the Final Four. The South region is all about Virginia. Can the Cavaliers erase the disappointment of last year’s loss to 16th-seeded University of Maryland-Baltimore County? Or will Tony Bennett and the nation’s stingiest come up short in March once again? 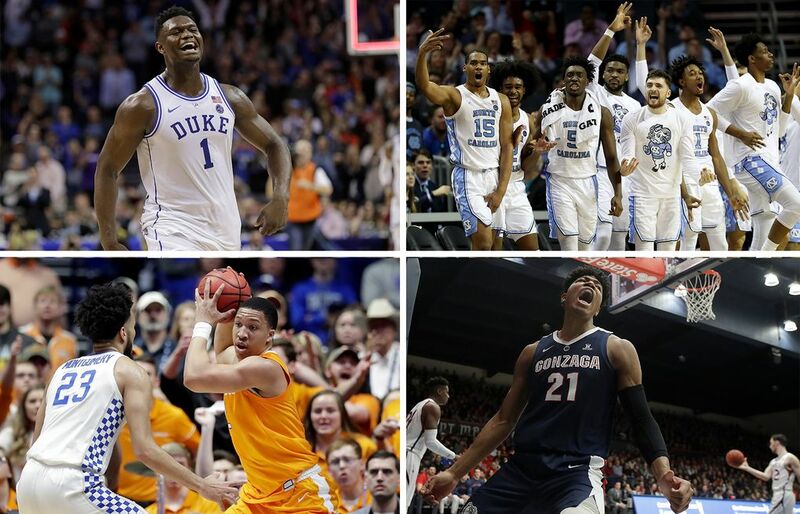 There are strong contenders — Tennessee and Purdue and the red-hot Oregon Ducks, to name a few — but Virginia is the overwhelming favorite to advance to its first Final Four since 1984. 1: The Gardner-Webb Runnin’ Bulldogs of Boiling Springs, N.C., are making their first NCAA tournament appearance. Their reward? A date Virginia, which earned the No. 1 seed in the South region for the second straight season. 24: Gardner-Webb is a 24-point underdog against Virginia. 20: Virginia lost by 20 points in the first round of the 2018 tournament to University of Maryland-Baltimore County, which became the first No. 16 seed to upset a No. 1. Virginia: The Cavaliers boast the nation’s No. 1 scoring defense for the third year in a row and should have plenty of motivation to prove last year’s mammoth first-round loss was an aberration. Tennessee: The Volunteers were ranked No. 1 in the AP poll a month ago but have slipped since. Their defense was exposed in the SEC championship game, an 84-64 loss to Auburn. Purdue: The Boilermakers won a share of the Big Ten regular season title and feature one of the most potent guards in the country in Carsen Edwards. Villanova: It’s been an uneven season for the defending national champion, but the Wildcats rebounded from a poor February to win the Big East title and have momentum. Kansas State: The Wildcats played the Big 12 tournament without senior forward Dean Wade, who was sidelined by a foot injury. The all-Big 12 first-team selection is questionable for the NCAA tournament. Oregon: The Ducks were 6-8 in Pac-12 play three weeks ago. Since then, they’ve won eight in a row, including a Pac-12 tournament title-game game win over Washington, and figure to be a trendy pick in their 12-5 matchup with Wisconsin. Saint Mary’s: The Gaels (22-11) stunned top-ranked Gonzaga to win the West Coast Conference tournament title, and their slow-it-down tempo ought to keep things close in the first round against Villanova. Colgate: In the NCAA field for the first time in 23 years, Colgate has won 11 in a row and ranks among the nation’s leaders in 3-point shooting (39.1 percent). Grant Williams, Tennessee: The 6-foot-7 junior was named SEC player of the year and averages 19.2 points, 7.5 rebounds and 3.2 assists. Jarron Cumberland, Cincinnati: The American Athletic Conference player of the year had 33 points and eight rebounds on Sunday to lead the Bearcats to a victory over Houston in the AAC tournament championship game. “Jarron is superhuman,” Cincinnati coach Mick Cronin said. Carsen Edwards, Purdue: The junior guard led the Big Ten in scoring at 23 points per game and ranks among the national leaders in 3-point field-goal attempts (31) and makes (107). Tony Bennett, Virginia: Could this be Bennett’s last dance with Virginia? The 49-year-old former Washington State coach is widely believed to be UCLA’s top target in its search for a new coach. Bennett has a 248–89 record in 10 seasons at Virginia. Collin Welp, UC Irvine: Welp, a Seattle Prep product and the son of the late Husky legend Christian Welp, helped the Anteaters win the Big West Conference title. A 6-foot-9 freshman, he ranks third on the team with 8.9 points, plus 4.4 rebounds, in 16 minutes per game. Tyler Cook, Iowa: The 6-9 junior leads the Hawkeyes in points (14.9) and rebounds (7.9) while shooting 52.8 percent from the field. Virginia: Is this the year the Cavaliers finally break through to the Final Four? Virginia has about the best draw it could have hoped for in the bracket — provided, of course, the Cavaliers can get past those mighty Runnin’ Bulldogs of Gardner-Webb in the first round.